Welcome to this latest website, which was established in 2016 on behalf of the Acronym Institute for Disarmament Diplomacy. We are a small non-profit organisation, founded in 1996 and based in the UK. Acronym is accredited with the United Nations through ECOSOC, and provides annual reports through the Department for Public Information (DPI). Acronym's work focuses primarily on humanitarian disarmament and diplomacy, international treaties and multilateral agreements, women, peace and sustainable security-building, and civil society activism. Our purpose is to draw attention to the interconnected human, environmental and security challenges that have become most urgent for humanity's survival. Our hope is to provide people all over the world with information, ideas and tools to make our societies safer, fairer and better. Though small, Acronym's research, ideas and activism have served diplomats, governments and civil society campaigns as a capacity-builder, particularly through the development of strategies and networks. For example, Dr Rebecca Johnson established the nuclear ban strategy and Geneva office for the International Campaign to Abolish Nuclear Weapons (ICAN), becoming the founding president and co-chair of ICAN's core group. 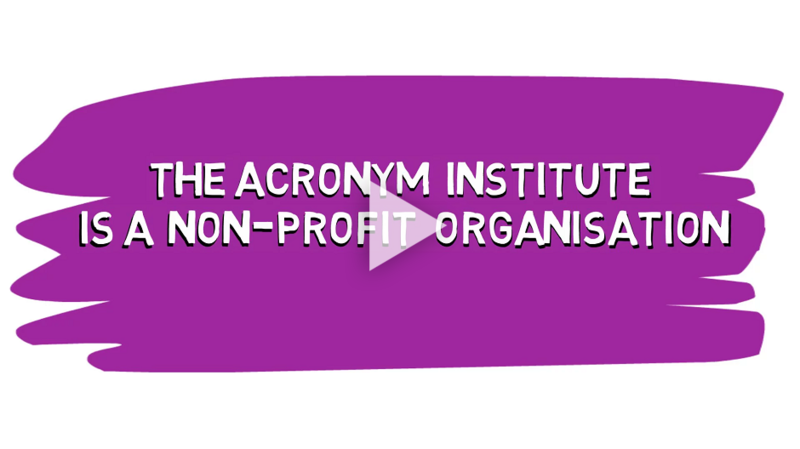 Following institutional restructuring, Acronym was made a founding member of ICAN's International Steering Group of ten organisations, where we continue to serve and coordinate the Campaign. ICAN was awarded the 2017 Nobel Peace Prize for mobilizing civil society and governments to bring about UN negotiations leading to the 2017 Treaty on the Prohibition of Nuclear Weapons (TPNW). Through Dr Johnson and Acronym associates Dr Natalie Goldring (Washington DC), Janet Fenton (Scotland) and Timmon Wallis (US founder of nuclearban.US), Acronym staff collectively or personally serve as partners in the International Action Network on Small Arms (IANSA), the Campaign to Stop Killer Robots (CSKR), the Women's International League for Peace and Freedom (WILPF), Women in Black, the UK Campaign for Nuclear Disarmament (CND), Pugwash, the International Panel on Fissile Materials (IPFM) and Women Cross DMZ, as well as activist networks. We hope our work and information encourage you to participate in campaigning for peace and planetary survival. As you can see from our various publications – from books to articles and pdfs of presentations given over the years to meetings and audiences around the world – our issues have ranged from humanitarian and diplomatic efforts to end the testing, production and deployment of various kinds of deadly weapons, from guns and rifles to drones and nuclear weapons, while also encompassing new security thinking, militarism and arms trading, ways to end institutional, personal and political violence against women, and encouraging the growing role of women in ending patriarchal conflicts and promoting alternatives for sustainable peace-building. For those that want to check out our 20 years of research and publications on the UN, Non-Proliferation Treaty (NPT), Comprehensive Test Ban Treaty (CTBT), Mine Ban Treaty, and other treaty developments and related political challenges, 91 issues of our journal Disarmament Diplomacy (1996-2009) are archived through our previous websites here. Since ceasing to publish our own journal in 2009, Acronym's director Dr Rebecca Johnson became a featured author for openDemocracy, where you can view her contemporaneous articles on the civil society and diplomatic developments that led to the 2017 Treaty, generally called the Nuclear Ban Treaty or "TPNW", as well as a host of other issues relevant to British and international security and feminist approaches to end violence against women and girls. Because we care about this fragile home we all share, and want to make the world safer, fairer, kinder and better for everyone. That may sound impossible, but we think that a lot more can be done – and that every one of us can make a difference. We are activists and academics, analysts and practitioners. Between us we have a wealth of knowledge and experience on issues relating to militarism, security, weapons systems, violence and also feminist, humanitarian, peace-building alternatives. So that's where Acronym has chosen to focus our work. Not because these are the most important issues – though we do think they are important and interconnected – but because these are the issues where we ourselves have expertise and ideas to contribute. We want to use our expertise and skills to help bring about the changes necessary to tackle climate change and conflicts and weapons that create misery, refugees, more violence and extremist violence and terror. None of us can be made safer by weapons that have the power to destroy us all. Our future is not secured by unjust economic policies that destroy our environment and poison our land, sea, air and bodies with toxic chemicals. Killer robots and weapons in space are as risky and insane as nuclear weapons. Why continue bringing the dangerous mistakes of the last century into this one? We at Acronym are realistic about the risks and challenges humanity faces. But we believe that change is possible, and knowledge is power. That's why we continue to do our best through research, writing and activism to raise awareness of what all these weapons do and how they can be stigmatised, banned, reduced and eliminated – and what we can do to tackle violence and reduce the risks of conflict and war.